There are few types of bathroom construction tasks that are more difficult than putting down tile. This is because tile has to be put down just right in order for it to look good and last a long time. 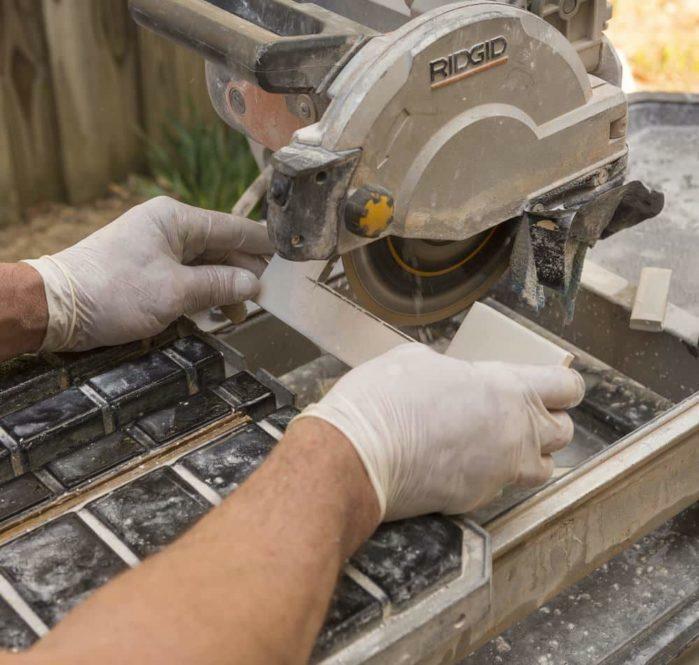 Laying tile also requires doing precision cuts on tile pieces in order to get them to fit. It’s almost like putting a puzzle together. That is why having the use of the best tile saw you can buy is critical to getting your tile job to come out looking great. For those of you that are not familiar with tile saws they come in all different shapes and sizes. Shopping for one is not the easiest process. We will attempt to make that task a little easier for you. In this article we will review five of the top tile saw models and give you some other information that should prove helpful when you are looking to buy a new one. Here is an overview of the top model tile saws we will review in this article. Much more detailed information on them will follow the tile saw buying guide. Lackmond Beast10 - Professional 15 Amp Wet Tile Saw, 10"
How Does a Tile Saw Work? 3. Lackmond Beast10 - Beast Professional 15 Amp Wet Tile Saw, 10"
What Tile Saw Model Do We Like Best? Tile saws come in a wide variety of price ranges. Most anyone can find one that fits their budget. These power tools tend to follow the rule that you get what you pay for in most instances. In general the more money you pay for a tile saw the easier it is to use and the better it performs while using it. Like any power tool you buy you have to balance your needs with your budget too. If you will be using your new tile saw a lot then you can justify spending more money on it. So decide what quality of tile saw you need and then determine what your budget range is for that purchase. There are several different types of tile saws available in the tool marketplace. 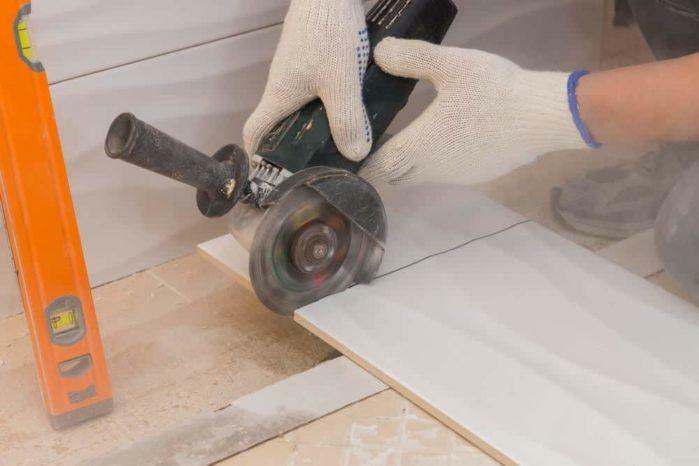 These are the most popular types of tile cutting devices. These are by far the most commonly used tile saws. They are often the choice of professionals. Table mount tile saws can be used for making either wet or dry cuts and the cuts they make are very precise. These types of table saws also allow you to do tile cutting work much faster than other types of tile saws do. The only real drawback with them is they can be heavy to move around as you take them with you from job to job. Many people mistake these for handheld circular saws but they are usually much smaller in size and use much smaller blades that don’t have teeth. They offer those that do tile work with the utmost in portability. They are best used for working on tile tasks that do not require numerous precision cuts to be made. These tile saws come in both wet and dry versions too. One of the big drawbacks with them is the blades on them are not big enough to cut through real thick pieces of tile. They are also much harder to make precision cuts with. They are perfect for people that require a very portable tool to make just a few cuts at a jobsite. Tile grinders are mainly used for making rough cuts on larger pieces of tile in the field. You would have a hard time using them on smaller tile because these require precision cutting and that is hard to do with a tile grinder. Tile saws can be wet tile saws, dry tile saws or a combination of both. Most people who use tile saws on a regular basis prefer wet tile saws. This is because they keep the channel clear where the saw is cutting and they also help keep flying dust to a minimum. Almost every table mounted tile saw is a wet type saw. Portable handheld tile saws are available in the most variety of combinations. We recommend that any handheld tile saw you purchase at least have a water hookup option. It just makes cutting tiles much easier and less messy. There is one big drawback with portable handheld tile saws and that is that they are not built to cut through really thick tile material. They are usually not good at cutting any tile over 1 ½” thick. So if you are going to be cutting thick tile or other masonry products on a regular basis then you will need a table mount type of tile saw. The bigger the blade is on a tile saw table model the thicker the material it will be easily able to cut through. Tile saws work in a pretty harsh environment to say the least. Any time you have an electric power tool that is repeatedly subject to dust, water and high heat you have the potential for failure. That is why it’s a great idea to get as long of a warranty as possible with any tile saw that you buy. A good long and comprehensive warranty will give you more peace of mind when you make your tile saw purchase. This is especially true the more you pay for that new tile saw. Here are some videos that will supply you with some more information on how different tile saws are used. This will help you to better understand what you need to be looking for when you are searching to buy a new tile saw. Here is what we feel are some exceptional tile saw buys. These model tile saws are consistently rated very high by those who purchase and use them. This is a very impressive table mount tile saw to say the least. Everyone here thought it to be an exceptionally well-designed product. DEWALT is a reputable name when it comes to power﻿ tools and this tile saw shows why. Here is a tile saw that has a powerful 1.5 horsepower motor and a stainless steel fence to guide you in making precision tile cuts. It can even handle cutting thicker size tiles without a problem. The dual water nozzles can be directed to where you need them so you can keep the blade clean as it cuts and cut down on the amount of dust stirred up while cutting too. This tile saw even makes very accurate miter cuts up to 22 degrees. This becomes even a better tile saw buy when you factor in it comes with a free stand and is backed up by a full three year warranty. This tile saw is one of the more budget friendly tile saws on our top review list. Just don’t make the mistake of thinking that its low price means it will not work well. Those who have purchased and used this model rave about how well it works for them. SKIL has come up with a tile saw model that generates a generous 3600 RPM’s of tile cutting power. You can even make angled tile cuts up to 45 degrees with this model table saw. It also features a durable stainless steel top. Its embedded water reservoir will help keep your saw blade cool as it works and the dust from flying around. It even includes one 7 inch diamond tipped blade and all the tools needed to make adjustments on it. This saw product is nicely backed up by a 3-year SKIL benchtop warranty too. Here is a model tile saw that any professional tile installer would be proud to own and use. It really works that well. This tile saw is designed to cut fast and accurately on all different types of tile and masonry products. With its 10 inch blade it can even make thicker cuts too. This machine is known for making very accurate cuts on tile and other masonry products thanks to its design and its 15 amp direct drive motor. It’s accurate to 1/32” in most cases. You don’t get much more precise than that on a tile cut. Its nicely designed snake pipe water system will spray water wherever you need it while cutting too. This is one tough tile saw too. It is framed steel pipe tubing and many of its parts are made from durable stainless steel too. There is also a very generous 3 year warranty period for this product too. This is the first handheld portable tile saw to make it onto our review list of the best tile saw products. It is made by Hitachi which has an excellent reputation in the small power tool marketplace. This is a model tile saw that is super portable and can handle just about any tough tile or masonry cuts you need. It’s a tile saw that features over 11,000 RPM’s of cutting power. That is enough juice to easily cut through most tile, stone and other masonry products. 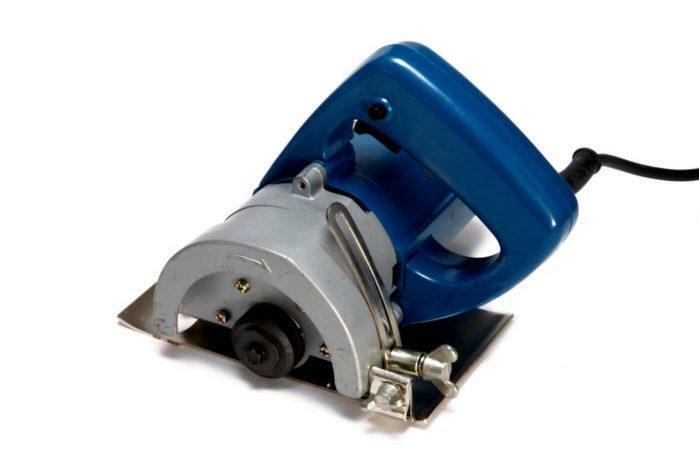 This tile saw model also has a solid steel core which will help to eliminate much of the vibration when using it too. The warranty is not great with this tile saw because it only provides 30 days of coverage but they do throw a nice diamond tip wet/dry saw blade into the package at no additional charge. Here is another handheld portable tile saw model. This one is built by DEWALT and it is the second of their outstanding tile cutting products on our top review list. This is an excellent model for those people who need a tile saw that is easy to take with them and only need to make a small amount of tile or masonry cuts at a time. Its powerful 12.5 amp motor stays cool longer and lets you cut through such materials as tile, brick and masonry very simply. One of its better features is the trigger lock that will help reduce fatigue when you are making cuts that require more time. This solidly built handheld tile saw weighs only 6.6 pounds. It includes a premium quality 4 3/8” cutting blade so you can get started working right after you take this product out of the box. This item is also backed up by DEWALT’s very good 3-year limited warranty. We will start by saying that all of these tile saws are worth purchasing if they meet your tile cutting requirements. The model tile saw we like best would have to be the Dewalt D24000S Heavy-Duty 10-inch Wet Ti﻿le Saw with Stand. It just had so many features that made it stand out to us. For one it was the only tile saw on our top review list that included a stand with the purchase. It also has a very powerful 1 ½ horsepower motor that can easily make any straight or miter cut you need up to 22 degrees. Its dual water channels are also able to be aimed at the exact spot you want the water streams to go. The stainless steel fence it comes with is built to last and will help ensure that your cuts are done accurately too. When you factor in that this tile saw model cleans up easily and is backed up by a three year warranty it really makes it an exceptional product. So if you want a tile saw that is easy to use, powerful and makes precision cuts every time; then you will most certainly want to consider this DEWALT tile saw model. It’s definitely among the best tile saw options there is in the tool marketplace.